There are probably no industrial estates where flagpoles with hoisting flags are not seen, waving for your attention. They are generally representative flags and promotional flags in front of main buildings and showrooms, entrances to exhibition halls and public institutions, or even in front of banks and insurance companies. You can make your own flag and get it digitally printed in no time at all. As it is really important to attract the attention of potential customers, it is a great idea to do this with a custom printed flag. MahaMeru Bali Printing have recently started to offer custom fabric flags! Our custom printed flags are made of Satin fabric material. The fabric is not see-through which ensures that you can draw attention to your message with the same image on both sides of the flag, which of course is mirrored. You can order your new promotional flag with us in four different sizes. You have the option of three different attachments to your company flag. If you already have a flagpole and the necessary accessories for it, the eyelet option will be the best one for you. If however you are still considering the mounting options the snap hooks might be a good option. These are great as they do not create an annoying rattling noise, which could cause resentment among those working or living in the area. If you want your flags to be extra visible, simply choose the option with the cantilever. In this version you get an additional hemstitch on top and either loops or snap hooks on the left side. The cantilever makes your banner spread out fully even without wind. You use your existing cantilever in the hemstitch and then attach the vertical side of the flag. 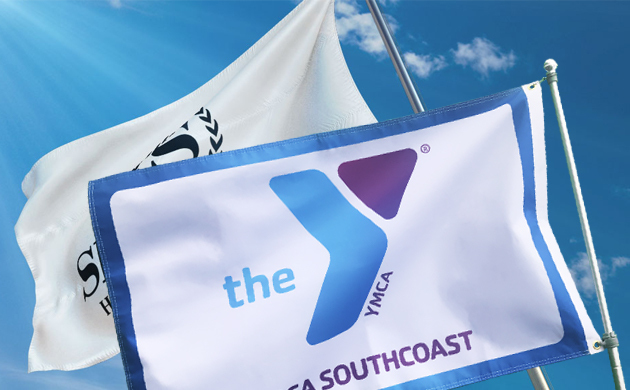 After a few minutes your new company flag hangs stable and easily visible on the flag pole.